Based off of an annoying experience with a water faerie, so I wrote this. Know that faeries have troubles, too. Wilma liked faeries. She liked faerie quests. She enjoyed helping faeries. Even with the fire faeries impatient and the dark faeries somewhat threatening at times, she was adamant in her effort to serve the faeries and get rewards, mainly gaining stats. The young blue Kau was no stranger to hard work as it was because of that; she even enjoyed it, and relished the feeling of effort. Wiping some sweat from her brow, she rushed in with her pair of sunglasses a fire faerie had requested into the Faerie Quest Center. A short-haired fire faerie looked up, smiled, and curled a lock of red hair in her fingers. "Well done, Wilma. Fastest record this week! Here's your reward. Increased strength, as usual," she said. She flicked her fingers, some light rose and settled around the Kau, and she felt somewhat stronger. She smiled. "No problem; I appreciate the effort-"
"Reena!" A frazzled voice rang in the air. The fire faerie grimaced and turned towards the source of the voice to see a water faerie bounding up to her, Wilma giving the water faerie a puzzled look. Her blond hair was a little messy, her eyes narrowed. She spoke. "Stop taking quests from me! I need someone to take my quest, too!" Reena narrowed her eyes. "Raina, calm down. There's plenty of other neopets willing to take a quest from you. Go ask them. And I asked Wilma here to do a quest for me already today, and she's just completed it," she said. Then under her breath, added, "Or maybe it's because you're too psychotic to get any neopet to do a quest for you." "What was that?" Raina snapped. Reena shook her head. "Nothing, Raina. But yes, go ask another neopet for help." "Nonsense!" The water faerie calmed slightly. "Dear... Wilma. Would you mind doing another quest today?" "Yes, ma'am!" the Kau had promptly responded with vigor. Reena looked apprehensive, Raina pleased. 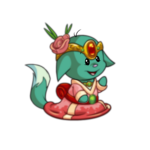 "Thank you, young neopet. Now... this is probably a very hard quest. I want you to go fetch me The Grarrl Who Crushed Tyrannia. Got it? Be back here as soon as possible." "Yes, ma'am!" And with that, Wilma had run off. Reena scowled at Raina. "Really, Raina. It's a big effort in the first place to send a neopet off to do one quest a day; but two? It's not like the Questing Faerie's quest where you can just go buy the items in one place; no, she has to search high and low in the marketplace without the Shop Wizard's help. Heck, she can't even shop around for a better price on that book of yours. I hope you know you're being greedy; you better reward Wilma well." "I'll reward her as needed, Reena." She snorted. "She could've said no." "Oh, and be subjected to your grumpiness upon rejection? She was being polite." "So be it. I'll be the judge of that." Wilma stared out at the marketplace, a bag full of 3,000 neopoints in her hand. It should be enough to suffice for the book, she guessed. Taking a deep breath, she stepped back into the place. Shop after shop, she entered the books section, only to be fruitless. She was shocked. Surely such a book cannot be that rare to stock! Wilma had even read the book herself; it wasn't too hard to find. But somehow that day it was evading her. For two hours she roamed the shops, looking aimlessly for the book. She grew exhausted, but persisted. I can't let a faerie down, she told herself. Finally, in what felt like the millionth shop she came across, she entered the book section. Multiple books of all types passed her eyes. She flicked them sleepily to find her item she so eagerly needed. But she froze over at a book that came into view, staring intensely at it. An angelic aura almost surrounded it. It was a copy of The Grarrl Who Crushed Tyrannia. Immediately grabbing it, she read the cost... and her jaw dropped. She shook her head. After two hours of search, she didn't even bother to shop around anymore. Quickly purchasing the book, she sped out of the shop and back to the Faerie Quest Center as fast her hooves could take her. "Where is she?" Raina moaned impatiently. Reena looked up at the annoyed water faerie with an eyeroll. "Give her a break, Raina. Sometimes items are hard to find. Most neopets would've given up by now, and trust me, Wilma does not give up. Ever." "You so sure?" Raina grumbled. Reena frowned. "I'm positive. I've had her do quests for me for awhile now. I know her well." "Hmmph. Oh, finally!" She sighed as she saw an exhausted, sweating, dirty Wilma running up. "About time." Wilma breathed out, wheezing as she gave the book to the faerie. "H-here's your book, ma'am." Raina took it with a sniff. "Took you long enough. Here's your reward." She waved her hand, a blue glow surrounded Wilma, and her defense went up. By one point. She looked at a loss. For all her work, that's all she got? Shaking her head, she decided to not press the subject. Turning around, she was about to tiredly trot home when she heard Raina turn to Reena and mutter, "Guess who I'm not giving another quest to ever again." Her temper rose. Shaking, she turned back to the faerie. "Excuse me?" Raina looked down. "Ma'am, I have searched for two hours in a busy marketplace for a book only to have to buy it at a severely overpriced cost with my own neopoints. After I had already completed a quest for another faerie. I was nice enough to bother to do something for you, and you snottily say that behind my back, when you know I could've said no!" She grew angrier by the second. Her formerly blue cheeks had gone red. "And you can't even have one bit of respect for a hard working neopet! Well, let me tell you something! Without us, you couldn't get any of your quests done! I work for the faeries because I want to help you all after Faerieland crashed! Rewarding me with one measly defense point is one thing, but then to criticize me behind my back? I'm not ever helping you again! Good day, madam!" Wilma finished her rant and turned away with a huff. Everyone in the center, even Fyora, had turned to gawp at the shouting Kau. As soon as the frustrated neopet left, Reena's jaw was still open as well as Raina's. "...She... she has never had an outburst like that..." The faerie shook her head. "and she was completely right to boot," she said with a snort. "I really hope she comes back and that you didn't anger her so much she doesn't come back. She was a big help. Thanks a lot, Raina," she hissed. The fire faerie left, and Raina felt eyes angrily boring into her. Turning away shamefully, she left. It was much a debate in Wilma's mind as to whether or not go back to get another faerie quest. In the end, she decided to, since she couldn't base the actions of one faerie on the others. When she entered the center the next day, she walked up to Reena. "Good day, Reena. Do you have a quest for me today?" The fire faerie shook her head. "No. However, Raina would like to have a word with you." Before Wilma could demand why, she continued, "Just trust me." At that, the Kau grumbled and followed the fire faerie to another part of the center. A certain water faerie was waiting, leaning her body against a tree, a stream of water brushing against her tail. She looked up. "Wilma." "Reena, could you leave us, please?" "Gladly." Reena left. Wilma's eyes watched carefully, waiting for whatever the water faerie had to say. The faerie before her straightened her back. "Wilma, you know what this is about. And that little lecture you gave me yesterday... I deserved that." "I deserved it because I've thought about it overnight, and I realized what a jerk I was being." "Why were you so mean?" Wilma finally blurted. The faerie's eyes half-closed. "The last couple of days, no one had been taking my quests because I had been grumpy. And... I was desperate. I had no new books to read, and you know, water faeries don't last long like that." She tried to chuckle. Wilma's suspicion fell slightly. "And why were you so grumpy?" Raina grew dead silent for awhile. She bit back tears and looked up at Wilma. "...Promise not to tell?" Raina looked around carefully, then turned back to the Kau. "A few days ago, my Faellie... we were wandering through Meridell, and she happened to get a little too curious around Turmaculus when I was buying us lunch. It broke my heart. She was my best friend." She tried not to sniffle. "And I guess I've been taking that out on people, even though it's not an excuse." Wilma shook her head, surprised by this story. "No, no. We all get sad when we lose something dear. I'm sorry for your loss." Raina sniffled. "T-thank you. And to make up for it..." The faerie waved her hand again. A blue glow surrounded the cow. "I've given you four defense points." "Seriously. You've put up with enough and you earned it. Now, I've also talked to Fyora; she has something she needs you to do for her..."